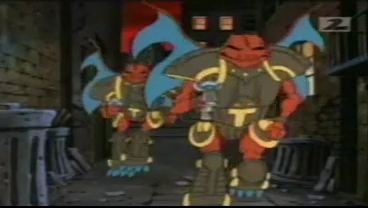 The Batmen are ugly winged humanoids that replaced the TechnoGangsters as the soliders of Lord Dregg in the final season of the TMNT 1987 animated series. Their large wings do in fact enable them to fly, although they seem to spend most of their time on the ground when in combat. It is also known that they have limited intelligence, as this was shown in the episode, A Turtle in Time, when April O’Neil tricked one of them into helping her and the Turtles escape Dregg’s ship, and in the episode, Turtles to the Second Power, when Krang easily hypnotized one of them to help him and Shredder take over Dregg’s invasion force.